Convert DXF to PDF. DXF Converter, DXF to PDF Converter. AutoCAD Drawing Interchange Format to Portable Document Format Conversion. Convert your DXF drawings to Adobe PDF files without the need for Autodesk AutoCAD® or Adobe Acrobat®. 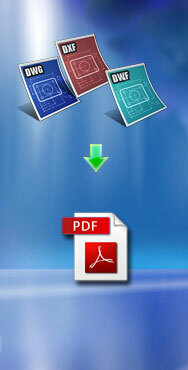 Easy CAD to PDF Converter features DXF to PDF conversion. It is more than a file format converter, and you can even batch publish your DWG drawing files to PDF files of any size to answer your specific needs, such as to facilitate the readers of your CAD drawings who have no AutoCAD-based software products installed on their computers; PDF is an open standard for audiences from almost all walks. · DXF (Drawing Interchange Format) is a published file format used for interoperability between Autodesk products, third-party applications, and non-Autodesk products. ASCII DXF and binary DXF options are available for data exchange.